It was a rough year for Philadelphia soccer in the pro ranks, but if you go beyond that, there were some major bright spots in the local soccer scene. A local amateur club was the nation’s best. A local woman won the World Cup with one of the most clutch performances in the sport’s history. The region’s most historic club got a reboot — sort of. And the pro team may finally have turned the corner on its dysfunction, although we’ll get a better sense of that next year. Do the silver linings compensate for the mess that was Philadelphia Union this year? Probably not. But there was enough good to be found that we’ll remain cautiously optimistic for the coming year. Meanwhile, let’s look back at the best and worst of the year that was. C.J. Sapong. Sapong produced his best season in years once deployed in his preferred center forward role. His athletic ability, holdup play and finishing won him a starting role for Philadelphia Union, and he left behind a drunk driving incident as well as one can expect. Honorable mention: Andre Blake, Richie Marquez. In a year with few good candidates, Blake was that good in limited activity. Marquez was good all year. Maybe it’s telling that all three began the season struggling for playing time. Carli Lloyd. The native of Delran, N.J. wasn’t just the world’s best female player this year. She was the most clutch. They’ll be telling stories about the U.S. international’s hat trick in the World Cup’s final game for years to come. Derrick Jones. 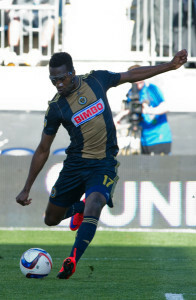 Jones went from an unknown teenaged immigrant playing with Junior Lone Star FC to Philadelphia Union training camp and a contract as the first player ever signed by the new Bethlehem Steel FC. He may not be an amateur anymore, but the former Union Academy player’s rise to the pros is a story worth paying attention to. Blaise Santangelo. Santangelo has taken West Chester United’s senior men’s team from nonexistence to champions in just five years. The amateur club’s rise to dominance at its level reflects the high level of coaching and recruiting demonstrated by Santangelo, who was also named USASA Region 1’s coach of the year. West Chester United. “National champs” has a nice ring to it, no? 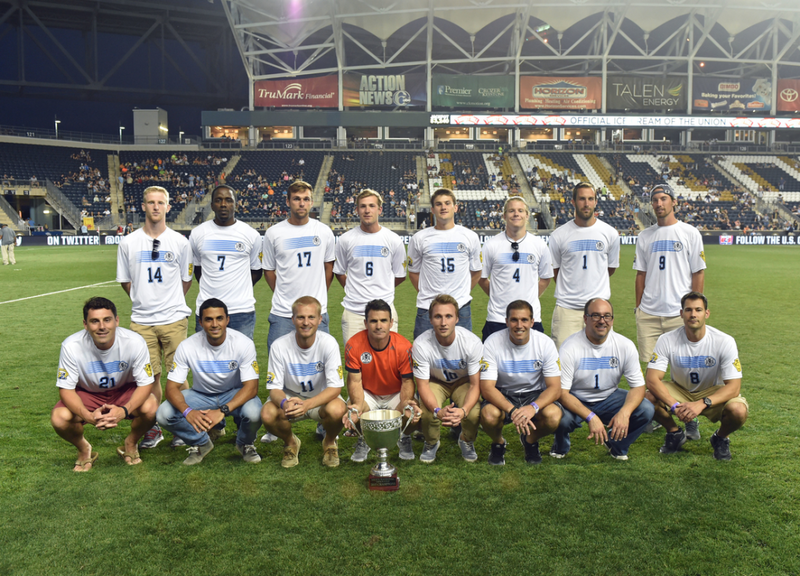 In June, WCU became the first Philadelphia-area team to win the United States Amateur Soccer Association’s national Werner Fricker Cup championship since United German Hungarians did it in 1999. Earnie Stewart. Stewart fits the profile of the ideal MLS general manager, with his European track record, MLS, European and U.S. national team playing experience, and affinity for Moneyball. He is a game-changer who many feel will drastically alter the direction of the franchise. Check back in a year for progress. Brian Carroll. Carroll went from quiet stalwart of every team he played on to punching bag for Union fans over his first few years with the Union, but he started to win them back this year. Certainly, he won us back, although he never fully lost us. Carroll never deserved the ire some turned toward him, but he definitely deserved some praise. He remains what he always was: A solid defensive shield for a back line who plays hard. He may be limited in attack, but he is good at what he does. Richie Graham. The Union minority owner stepped out of the shadows in a big way after the firing of Nick Sakiewicz, working behind the scenes to broker the move that brought Earnie Stewart into Union organization as sporting director. Graham likely played a bigger role than outsiders realized during Sakiewicz’s last days, but whether or not he was instrumental in Sakiewicz’s ouster, he was the linchpin to bringing in a big name to rebuild the club. 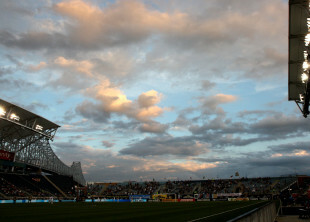 Philadelphia Union’s U.S. Open Cup win over the New York Red Bulls. They were on the road, down a man, with a young, local guy in goal. John McCarthy’s heroics secured the upset. Cristian Maidana’s free kick against New England. It was brilliant. Andre Blake vs. New England. Blake stood on his head against the Revs in September with remarkable save after save, producing arguably the best goalkeeping performance in Union history and solidifying himself as the team’s starting goalkeeper. Andrew Wenger’s dribble past the end line. Wenger dribbled past the end line. Undefended. On the attack. But we’re also going to remember another one. Andre Blake’s big save vs. New England. His whole performance against New England was mind-blowing, culminating in the save that left these and other New England fans unable to believe he did that. Honorable mention: Jim Curtin pulling Blake from goal against Kansas City in the U.S. Open Cup final. Vincent Nogueira’s back-heeled goal against the Red Bulls. Firing Nick Sakiewicz. Sakiewicz had to go as chief executive. He had burned up every ounce of political capital and become a punching bag for fans looking for (and finding) someone to take their frustration out on. His inability or unwillingness to hire a general manager during a nearly year-long search was a damning mark against him and his legacy. Honorable mention: Hiring Earnie Stewart. Trading Sheanon Williams for peanuts allocation money and “future considerations.” The stalwart right back’s departure was probably overdue, as the Union had two starting quality right backs and needs elsewhere. His trade cleared budget room for Tranquillo Barnetta’s signing, but many wish the Union had found another means to accomplish that or at least gotten more in return. Williams slotted in immediately as a starter in Houston, while his replacement, Ray Gaddis, endured his worst struggles in an otherwise stellar Union career. We’re still not sure what the “future considerations” in the trade were, but the Union made another major trade with Houston earlier this month, so maybe that was part of it. Every time Jim Curtin makes a mid-season declaration that a player is his new starter for the rest of the season — Rais Mbolhi, Carlos Valdes, and now Gaddis — it backfires. Even the generally stellar and dependable Gaddis couldn’t avoid this new little curse. Look for Gaddis to rebound better than the other two. John McCarthy after his first win starting for the Union. Just watch and listen. Sporting Kansas City. The Union’s most natural geographic rivals are D.C. United and the New York teams, but few can deny that a rivalry with Kansas City has organically emerged. SKC’s victory over Philadelphia in the U.S. Open Cup cemented it. Too bad they’ll only play once a year now that they’re in different conferences. Nick Sakiewicz’s last days (weeks and months). 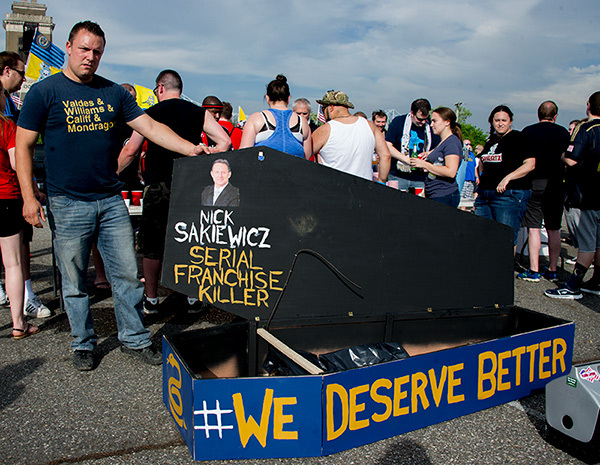 The infamous coffin protest (impossible to argue against based on how low he had dropped in fan esteem. The Union lose the U.S. Open Cup final — again. On one hand, it’s an achievement to make the finals two straight years. On the other, the Union lost them both and didn’t see the postseason, so what people remember most are the losses. (Dis)honorable mention: Andrew Wenger. We thought this would be his breakout season. It was exactly the opposite. Richie Marquez. Some of us had been clamoring for Marquez to get playing time after his impressive 2014 spent at Harrisburg. It took a series of injuries to the Union’s center backs for it to actually happen. Then Marquez stepped in and played like one of the league’s better center backs. He is now the most automatic starter on the Union’s back line and, with his great speed and athletic ability, has some wondering about his national team prospects. Honorable mention: Eric Ayuk. Nobody knew who this kid was. They know now. Also, Brian Carroll’s solid year. The Gold Cup final. It doesn’t matter that the U.S. national team didn’t make it. Any time a major confederation’s tournament final is local, that’s going to be worth seeing. This was no different. Sons of Ben: The Movie. Check out It’s worth seeing. Bethlehem Steel FC. Starting a professional minor league team in Bethlehem was the Union’s best move in years. They hired the right guy to lead the team in Brendan Burke, they put the team in the right place (the Lehigh Valley) and dove into the annals of American soccer for an inspirational name. Now let’s see what they can do on the field. Fall 2015. Union fans were fed up with their club as this year’s season closed out. Many chose not to renew their season tickets. Many more just stopped coming to games. The Union were losing their base. The firing of Nick Sakiewicz gave some fans pause. The hiring of Earnie Stewart jumpstarted optimism where before there had been little. The return of Brendan Burke to head new Union affiliate Bethlehem Steel FC was another good sign. The cutting loose of nearly half the roster in the weeks after the season closed at least showed there would be something going on here. Philadelphia fans are sometimes dismissed as crazy, hopeless souls. Now, this may be true in many cases — if you suspect this refers to you, then yes, it probably refers to you — but one thing fans did well in 2015 was exercise the influence they rightly have. The spring protests and its echoes undoubtedly contributed to the changes in the Union. So too did the intelligent criticism that joined it. No MLS team saw its fans play as crucial role in launching a club into existence as Philadelphia’s fans did. This year, they finally flexed their muscles again to shape their club. Early signs are good, but we’ll see next year just how much of a difference it truly made. Thanks for reading the Philly Soccer Page this year and helping to make it such a worthwhile endeavor. We’ve lucked out with great readers and a great team of volunteers to help make this site what it is. This site lives because of you. Best US soccer website: PSP. Again. Wishing us better MLS material for 2016. Cheers! It’s so true, I pity those in other cities so wholeheartedly. Thanks Dan and all the contributors that produce such an informative and entertaining site. Sadly, I am one of those supporters that gave up my tickets. 6 years was all I could take but I’ll still be here in 2016 keeping up with the U. Happy New Year and here’s to another year of PSP excellence. Well done lads…well done. PSP and it’s fans, a symbiotic relationship. Thanks PSP. Happy New Year to all. May 2016 bring you all happiness, good fortune and good health! When I saw the headline, I presumed it would be for Best Columnist, Best Comment, Best Meme, whatever. And then I realized that everything belongs to Kyle for the Cliff of Union Despair and the Union Bible (Solar Rockets are so 2014). Congrats Kyle and Happy New Year. Wow, that should’ve happened. Next year, remind me! Cliff of Union Despair and the Union Bible are iconic. Easily the best thinking of the year. Happy New Year to everyone! Another great year of postings and commentary! This is the only reading I do some days! It’s by far the most enjoyable! Keep up the great work everybody! C’mon the U!! Kudos the Ed, Dan, Adam, Eli, and everyone else who is escaping my ancient “non-memory” who make this site reliable and worth reading. Keep yelling “man on!” or “turn!” throughout 2016. We nuts cannot do without PSP. Thanks PSP!!! Keep up the good work! Best goal celebration: Bimbo bread log cutting!! !